You MIGHT call this class “WHAT? This came from my scrap drawer?” It’s just SO much fun to see what you can make from a handful of colorful strips and some background fabric. And - biggie here - with this technique you will NOT be cutting off all the edges and leaving a wiggly bias edge on all blocks. It’s quick, it lends itself to all sorts of fabrics, it eats up your stash of left over strips, OR it’s perfect if you want to choose fabrics that fit your current preference. You’re sure to love this technique. Fabric Requirements. TBD - determined by the size block and the finished quilt you desire. We will focus on learning the technique then you can choose which to make. Ideas and fabric requirements will be supplied when you sign up for the class. 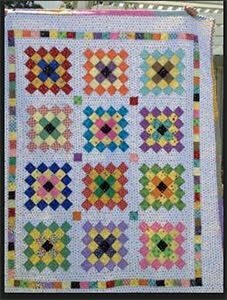 You may opt to make a bed size quilt, or start with just a small lap or baby size. Your choice. Ideas and fabric requirements will be supplied when you sign up for the class.